St. Petersburg is a great city for sightseeing. The city is almost a must when you are traveling to Russia. It has brilliant architecture and stunning landscapes, among the best in Russia. St. Petersburg is a UNESCO recognized world heritage site. Favorite landmarks are including the winter palace and the Hermitage museum. St. Petersburg also has exciting cultural and social life with many clubs you can go at night. Check out for some fun nightclubs you can go at St. Petersburg. Shopping is also a favorite, with lots of luxurious shopping malls to satisfy your shopping needs. For more affordable options, try out some street markets too. But what about education? It turns out that St. Petersburg is a great city for study too. The oldest University is located in this city, St. Petersburg State University. The city also has many others higher education institutes that range from research universities to technical universities to art academia. Here we compile lists of 7 Best University in St. Petersburg, Russia. Undeniably the top of our list, St. Saint Petersburg State University is number one of our 7 best university in St. Petersburg, Russia. It is ranked the best in Russia, in constant rivalry with Moscow State University. SPBU has educated notable graduates such as the Russian president Vladimir Putin. The university has produced a number of Nobel winners and noble laureates as well. St. Petersburg State University history is long as the university is established in 1724. It is the oldest university in Russia, founded by the decree of Peter The Great. Nowadays the university has 24 specialized faculties, catering for more than its 30,000 students. The university operates daily a historical building called Twelve Collegia, which has the longest university corridor in the world. Through knowledge to breakthroughs! That’s the slogan of Peter the Great St. Petersburg Polytechnic University. The 120 years old university has consistently become the best higher education institutions in Russia. It mainly focuses to train specialized graduates that are needed in various industries. 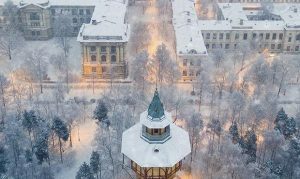 It has been doing so since its establishment in 1899, by a decree of Emperor Nikolas I.
Polytechnic University was modeled after British’s Oxford and Cambridge. At present, it has more than 30,000 students studying in its 21 faculties. There are 3000 international students, quite a lot thanks to courses in English offered by this university. This university is also affordable compared to universities in western Europe or the US, about 4-5 cheaper tuition fee with similar high-quality education, hence this also contributes to its popularity. The third on this list is a university specialized in medical studies. First Pavlov State Medical University of St. Petersburg is one of the top ten medical schools not just in Russia, but in Europe. Medicine itself is one of the most popular majors in Russia for international students, due to Russia renowned quality when it comes to medical studies. Fun fact, the university is originally built as a college for women only, but now it accepts both male and female as its students. There are 11 faculties with two of them are graduate studies. The rests are bachelor and pre-university. Students study medicine, Dentistry, Pediatrics, and Nursing among other things. An interesting fact, during world war II many graduates are sent to war and many fell. The university has a monument to commemorate their service and sacrifice. An Electrotechnical university is a unique higher education institute in Russia. It specialized in the oldest kind of electrical engineering, and mostly build shortly after electricity was founded in the early 19th century. St Petersburg also has one too. It is called Saint Petersburg Electrotechnical University and was founded in 1886. At present days the university trains 9226 students in 19 programs and fields. Programs expanded from more than electronics such as IT and engineering, telecommunications, biomedical engineering, and even management. The university ranks as number eight among other technical universities in Russia. In St. Petersburg alone, it ranks second after Peter the Great St. Petersburg Polytechnic University. Herzen University history can be traced back to the year 1797 when it was still in one institution as the imperial foundling house. This orphanage later developed into this Herzen University, an educational institution that was built by the concept of humanity. In its early years, the university mainly ran on charity and patronage. It provides education for abandoned and unfortunate children. The university consists of 11 faculties and 14 departments. Currently, it has 16,000 students with 2000 of them are international students. Facilities are complete including a large library, a museum, health facilities, and fitness center. The university has a cooperation with international organizations such as UNESCO and European Council. ITMO University started as Mechanics, Optics and Watchmaking Department in the Prince Nicholas Vocational School. It was the first and the only educational institution specialized in optics at the time. Now it’s a multi-level university with various faculties department. In 2009, it retained status as a National Research University. The university is top 10 in Russia according to Forbes Ranking. There are currently 12,000 students enrolled in this University. 1800 of them are international students. The top research fields here are including smart and technologies robotics, Life science, IT and information security. Top majors in this University are computer technology, photonics, biotechnology, and entrepreneurship. Saint Petersburg Mining University is not only the oldest technical university in Russia but also in Europe. It was founded in 1773 by Catherine The Great. It’s a higher education institute to train engineers and specialist for the mining industries. Russia was in great need capable mining engineers during the revolution industry era. So those are 7 best university in St. Petersburg, Russia. You can choose one based on what’s best for you. To study in Russia, do not forget to make a thorough preparation. Prepare the required documents and start learning some Russian too. Pick the best major and for financing your study, it is always a good idea to hunt a scholarship.